Anything dat look nice and shine is a good thing. Dat is why some smart people bring in old cars, carry dem to a workshop and spray dem over. When people go to buy a car, dem see a nice and shiny thing and dem believe dat dem get a good thing. Is when dem start to drive it, dem see smoke coming out de exhaust and dem does hear all kind of things knocking. Dat is de kind of trick Jagdeo pull pon Guyana when he announce dat he tek money from China to build a new airport. When dem boys check wha he really do is change de zinc pon de roof, lay some concrete blocks to expand de baggage area and paint up de place. 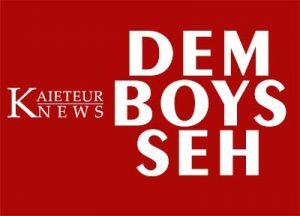 Dem boys calling on SOCU and SARA to conduct a forensic audit on de new airport. Dem want SOCU and SARA to check de wuk wha de contractor do pon de runway. Dem might find dat more than half de money end up in somebody pocket. When Soulja Bai become president, he had a plan to scrap de project but Jagdeo was one step ahead. He pay de contractor more than eighty percent of de project cost. Dat mean dat de government had to continue wid de project unless it did want throw away millions of dollars. And while people worrying about how Jagdeo set up Guyana, dem still got some who jumping up and singing high praise to Exxon. Last night, de Amazon Warriors blast Trinidad in fine style to get to de second spot in de race. Dis mean dat Guyana got two chances to get into de finals. Dem ain’t realize is dem own money sponsoring de Amazon Warriors. It might look like Exxon spending but one way or de other is de Guyanese who got to pay. But nuff don’t realize it. If Exxon don’t tek back de money when it bill Guyana, it gon claim it through tax deductions. Talk half and all dat glitters is not gold.